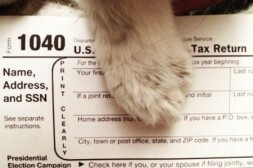 Tax deductions for foster pets might help you. There is a little bit of work involved but it is not complicated. Just like any other deduction, you just need documents to support the expenses. So keep your receipts and canceled checks. Also, keep track of and notate any expense that is not obvious. For expenses over $250 the organization needs to provide you with a written acknowledgement that contains a description and good faith estimate of the value of the services you provided. Of course, it is probably best to talk to your accountant to see exactly which of your foster expenses are tax deductible. Everyone I know that fosters says what you give out to a foster is returned to you two-fold. Now you can get some cash back, too. So if you are opening your heart, and wallet, as a volunteer foster with an qualified organization, remember that it could help you during tax-time. Ya know, just in case knowing you will be helping save cute furry lives wasn’t enough.